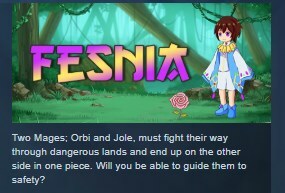 Fesnia is a platformer in which you play as either Orbi or Jole and fight your way through 11 exciting levels filled with monsters, puzzles, traps and more! Keep in mind that Fesnia contains little story and the cracks can be filled by the player's imagination. -Multiple enemies and traps to fight and avoid. -The ability to jump and attack back with magical abilities. -Double Tap W key for jump. -Enter key to reset the level.